A deck is an Aussie institution so there’s almost certainly no better place to use and enjoy an outdoor deck than on the Gold Coast. The weather conditions around the Gold Coast are perfect for outdoor living and for enjoying your deck. You can spend more time outside enjoying the warmer months whilst enjoying protection from the sun’s harsh rays. Moreover you can enjoy time outside the house even in boisterous weather staying comfortable and dry. Your outdoor furniture, BBQ and various other items are also safeguarded from the elements. Regardless of whether you have a residential home or apartment, an investment in timber decking on the Gold Coast will bring your family years of enjoyable outdoor living. A new deck creates a new space for entertaining plus adds value to your house. 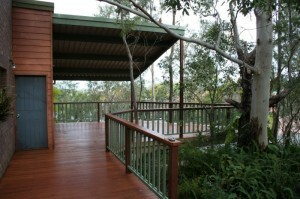 Outside Concepts are the industry gurus at designing and building timber decks for your Gold Coast home. Most decks are fixed to the house but detached decks can work well as a separated entertainment area or as a feature to cover a difficult or rough area. At Outside Concepts we specialise in designing your deck to match your lifestyle and budget. Read much more about Gold Coast decking or Gold Coast Patios on the Outside Concepts website or call us on 1800 601 674 to arrange an obligation free quote. I have outdoor rectangle patio area of 7.20m X 4.40m that I would like to deck. The area is currently grassed and basically flat. Any quotes would be highly appreciated? Hi Tyson I have sent a PM to your email address please let me know if we can assist you further..